We have the ability to shape our community for better or for worse. The words we use, the time we invest, and the connections we build can make our city a place we enjoy or a place we want to flee. Every person in Chestermere has that power. There is something else that is happening in our midst. Bit by bit, we are each being shaped by our community, too. Your place and the people around you are making you into the person you are becoming. The good news is that your neighbourhood could play a vital role in making you a whole person, full of new life and hope. They have that power, too. Even the hardest days have a way of making us. This month our very good friend and neighbour in Chestermere passed away suddenly. She was a mother of a four year old (my daughter’s best friend), and a six month old. These past weeks have been spent with each other, grieving and hugging and sharing stories. It has been hard in countless ways. While we are hearts are broken, we are also finding that our hearts are being remade. In community we are finding something we did not have before, we are finding that we are being made into new people. Without our friend, but with each other. Love is emerging where it may not have been before. Loving people and living with and among others is risky. 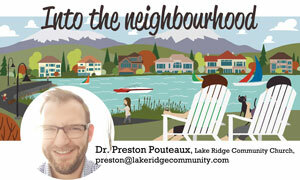 Being part of your neighbourhood may shape you in ways you did not expect. Yet I am finding that in loving our place and the people there, I am being shaped in ways I like. I love that others are making an imprint on my life, and my life is shaping others, too. I know others, and am known by them; it is good. There are other ways that our neighbourhood shapes us. We begin to live expectantly, hopeful that we will experience something profound and beautiful, and we think that perhaps our neighbours might have something to do with it. We become less afraid of each other and let our guard down in ways that allow good things to grow. We actively fight against cynicism because we know that it tarnishes the way we see others, so we intentionally pursue conversations that expand our heart for others. Finally, when we let our neighbours shape us, we realize that there is more to life than we often see. The Good Life is about being present to others, and it is made up of something that is more spiritual, meaningful and even more delightful than we were taught. When we let our neighbours shape us, even the hardest days have hope built in, we know that the hard chapters are not the last chapters – goodness may still be found. Sometimes it is important to stop and reflect on what is shaping us and making us into the people we are. So, what is shaping you? Whatever it is, do you like it? Are you becoming the person you hoped to be? It is possible that the people in your neighbourhood, if allowed in, could become the most special part of your story. They have that kind of power, and it is good.